A 4.6-mile (7.4 km) road ( NC 128) connects the scenic Blue Ridge Parkway to a parking lot where a steep paved 980-foot (300 m) trail leads through a conifer forest to the summit. The 40-foot (12 m) stone observation tower on the summit was torn down in late 2006. A new observation deck was constructed and opened to visitors in January 2009. Also on the summit is the tomb of Dr. Mitchell. ^ Davis, Donald E.; Colten, Craig E.; Nelson, Megan Kate; Saikku, Mikko; Allen, Barbara L. (2006). 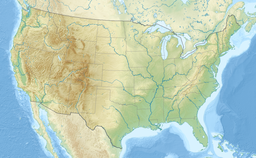 Southern United States: An Environmental History. ABC-CLIO. p. 261. ISBN 9781851097807. Retrieved 22 April 2019. 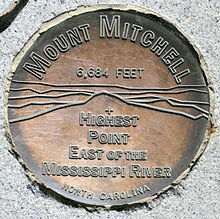 ^ "Mount Mitchell State Park | NC State Parks". 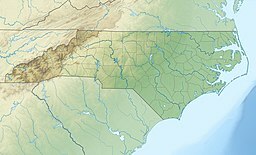 www.ncparks.gov. State of North Carolina. Retrieved 22 April 2019. ^ Dale Neal, " Mount Mitchell Digs Out From Record 66 Inches of Snow," USA Today, 25 January 2016.